For those of you interested in the preparation of your own hydroponic nutrient solutions, my hydroponic nutrient calculator should prove to be a very useful (hopefully invaluable !) tool to complete this endeavor. Within the following paragraphs I want to talk to you about the main objectives and uses of my calculator as well as some of the confusions that arises when people new to hydroponics and the chemistry of nutrient solutions starts to use it. After reading this you will be able to know precisely what my calculator does, how it can be useful to you and what the calculator simply doesn't do. 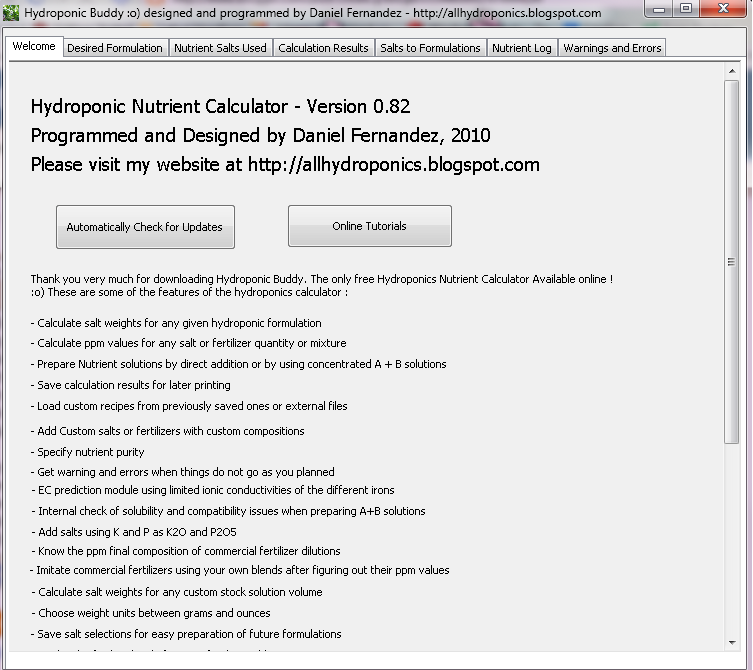 My hydroponics nutrient calculator (hydrobuddy, which you can get here) is a tool designed to aid people to prepare their own hydroponic nutrient solutions in a straightforward and easy manner. The idea of the calculator is to make all the mathematical calculations needed to go from a desired formulation composition to a given weigh of a fertilizer salt much easier than how it usually is with excel spreadsheets or manual calculations. Hydrobuddy therefore allows a person to know exactly how the addition of a given salt affects the concentration of a certain number of elements within a hydroponics solution, allowing the user to select and use the salts that precisely fit his/her desired formulation. The main function of hydrobuddy is to take a given formulation specifying the concentration of all the giving nutrients as ppm and translate it into the necessary weights of salts or fertilizers needed to achieve these concentrations. It is however important here to note that these ppm values have NOTHING to do with the ppm values read by your EC meter. The values an EC meter reads as ppm are TDS or salinity measurements that correspond to the concentration of a sodium chloride solution of equivalent conductivity. This measurement has nothing to do with the ppm values used to specify the concentrations of the different nutrients within a solution. Hydrobuddy also allows you to do some other very interesting things such as the calculation of salt weights for concentrated (1:100) stock solutions and the use of the "straight addition" method that allows you to calculate the weights of salts you need to add directly to a reservoir to arrive at certain concentration levels. Hydrobuddy also contains a "salt to formulation" feature which allows you to input a given weight of a salt or fertilizer and obtain the ppm values you would arrive to within your solution. 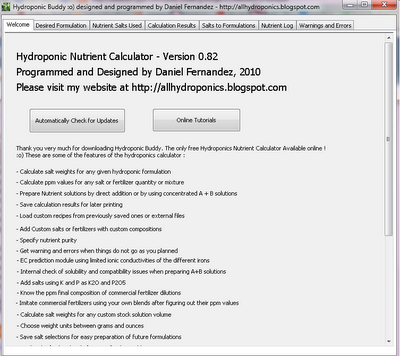 This should be especially helpful for those of you looking to use hydrobuddy as a way to calculate the concentrations you get when you using specific weights of commercial fertilzers; it is also great if you want to manually tweak your calculation results if the calculator doesn't give you the salt proportions you desire. The calculator also has a "nutrient log" feature that allows you to keep a record of how your hydroponic solution evolves, warning you when it is time to change solutions in recirculating systems or when pH swings are too wild. Hydrobuddy also allows you to use the "run to waste" option to login the pH and EC in-out measurements of your system to keep a record of how it evolves as a function of time. The nutrient log allows you to plot the evolution of your hydroponics system and quickly realize and correct any problems that might be happening. If your water is very hard or if you have other problems such as high nitrate concentrations, hydrobuddy allows you to input your water quality parameters by pressing the "water quality" button, letting you take into account the hardness and quality of your water when preparing hydroponic solutions. As you see my hydroponic calculator allows you to do many things easily which would definitely take a long time to do if done manually or with excel spreadsheets. The calculator allows you to quickly change formulations, used salts, custom fertilizers, etc without having to do a lot of effort. The checklist interface and the ability to save and load formulations makes the program ideal for those of you who do a lot of hydroponic growing with custom solutions but don't want to go through all the math or spreadsheet changes every time the formulation needs or when some nutrient sources need to be changes. Daniel: I've downloaded your Vs 1.4 and tried to follow your tutorials. However, the version I have has not the same look nor all of the tabs you show in the tutorials. There's no way I can do what you are doing as I do not have tabs: Desired Formulation / Nutrient Salts Used / Salts to Formulations / Nutrient Log. What's going on? (I have only 5x tabs: Welcome / Main Page / Results / Data Log / About Can you help? Thanks.